Hello to all the lovely teachers who are reading my blog! This Friday I am hosting a very special event! 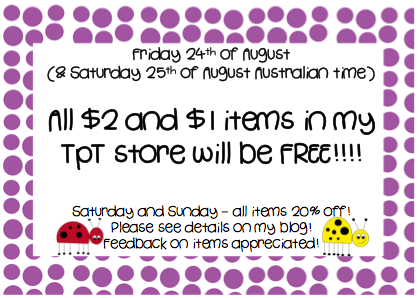 At 5pm Australian time (midnight Californian time) I will be marking each of my items that are $1 and $2 on my TpT store as FREE!!!!! That's right FREE!!!! What an amazing deal! But hurry, this will only last until 3pm Saturday Australian time (10pm California time on Friday). Then all previous prices return. 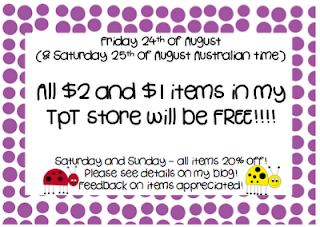 Then I will have a 20% off sale on all my items on Saturday and Sunday. Sounds GREAT doesn't it!!!!! There is no catch - only if you do download something, I would love to receive a feedback comment as a thank you for your freebie! 1. I know how hard teachers are working on a daily basis and although the pay in Australia is reasonable, US teachers deserve so much more!!!! So an opportunity to give out some freebies is my little way of making someone else's day! Please come, enjoy, comment and then visit again soon!